Image Size 20 x 18 in. Ashleigh Bartlett (b.1984 Calgary CA) is a visual artist interested in theatricality, abstraction, feminism and the history of painting. She received her MFA from the University of Guelph (2011) and BFA from Alberta College of Art + Design (2006). She has presented her work in group exhibitions across Canada at The Art Gallery of Calgary, The Kitchener Waterloo Art Gallery, and The Montreal Museum of Fine Arts. Recently she participated in the Imago Mundi “Great and North,” exhibition (Venice, Italy), “Restructured,” at the Nave Gallery Annex, (Somerville, USA) and exhibited her solo project “Alive with the Sun” at the Paniki Gallery (Batan, Philippines). Bartlett is the recipient of grants from Canada Council for the Arts, Alberta Foundation for the Arts and SSHRC. Her work has been included in the collections of Global Affairs Canada, the Alberta Foundation for the Arts, the Benneton Foundation, Scotia Bank and the Royal Bank of Canada. 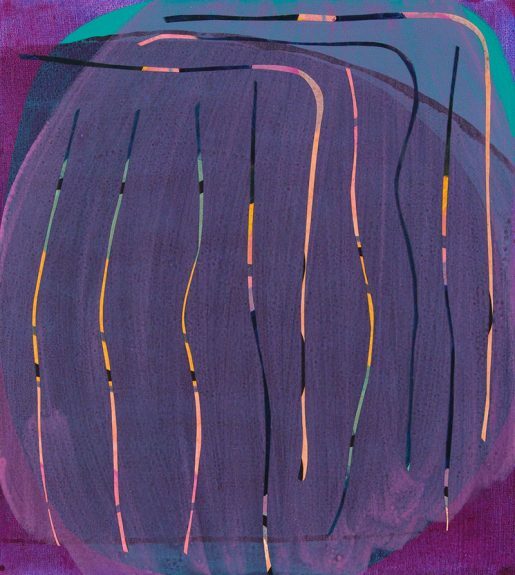 Bartlett was a finalist in the 16th annual RBC Painting Competition (2014) and she was awarded a Lieutenant Governor’s Emerging Artist Award (2016). She currently maintains a studio practice in Boston, USA.